The above image shows an F-35A at Edwards Air Force Base in California next to the F-35 systems development and demonstration weapons suite the aircraft is designed to carry. 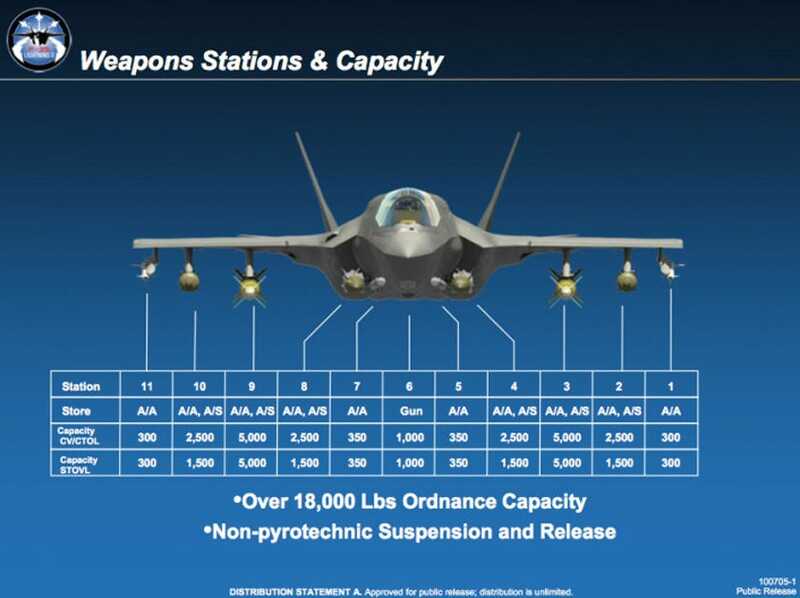 According to Lockheed Martin, the Joint Strike Fighter can carry more than 3,500 pounds of ordnance in low-observable (stealth) mode and over 18,000 pounds uncontested. The Lightning II is conducting testing required for full weapons certification through a campaign that included validating 2B weapons software and successfully executing several weapons separation and engagement tests. "Comprehensive flight test on the F-35A variant GAU-22 25mm gun system is scheduled to begin mid-year at Edwards AFB, Calif., and will include ground fire tests, muzzle calibration, flight test integration and in-flight operational tests," Lockheed Martin said in a press release. 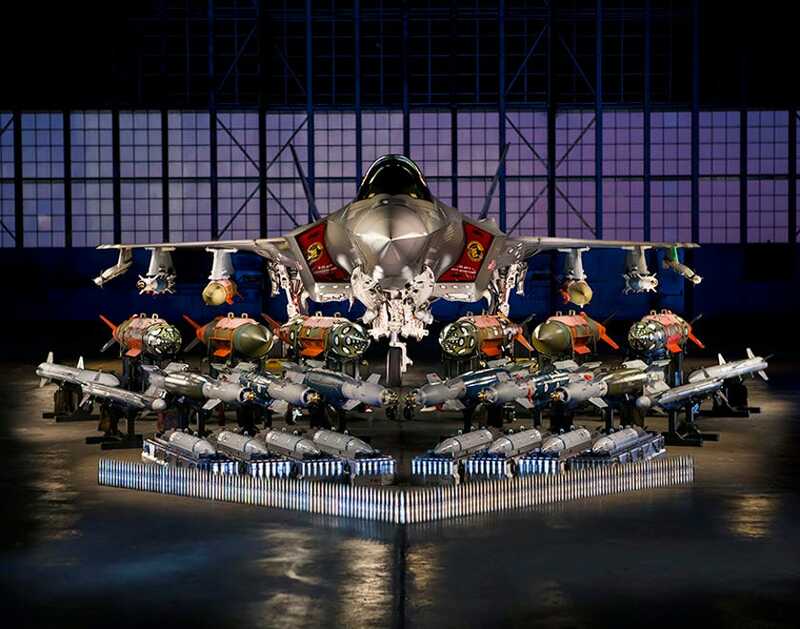 It continued: "The 25mm missionized gun pod carried externally, centerline mounted on the F-35B and F-35C also begins testing this year to meet US service's desired schedule for full warfighting capability software known as 3F. The 3F software is currently planned for delivery with the Low Rate Initial Production nine (LRIP 9) US aircraft in 2017." Among the most recent tests there is the first separation test of a GBU-39 small-diameter bomb, a 250-pound precision-guided glide weapon (Oct. 21) and multiseparation test (Nov. 20); first external flutter tests flown with the AIM-132 Advanced Short Range Air-to-Air Missile (ASRAAM) (Oct. 29) and Paveway IV missiles (Nov. 13); and the first supersonic-guided missile launch and the first JDAM release on target coordinates generated from the electro-optical targeting system (EOTS) (Nov. 18-25). The photo and updated weapons integration status report come few weeks after a report said the F-35 would be unable to use its gun until 2019. This article originally appeared at The Aviationist. Copyright 2015. Follow The Aviationist on Twitter.